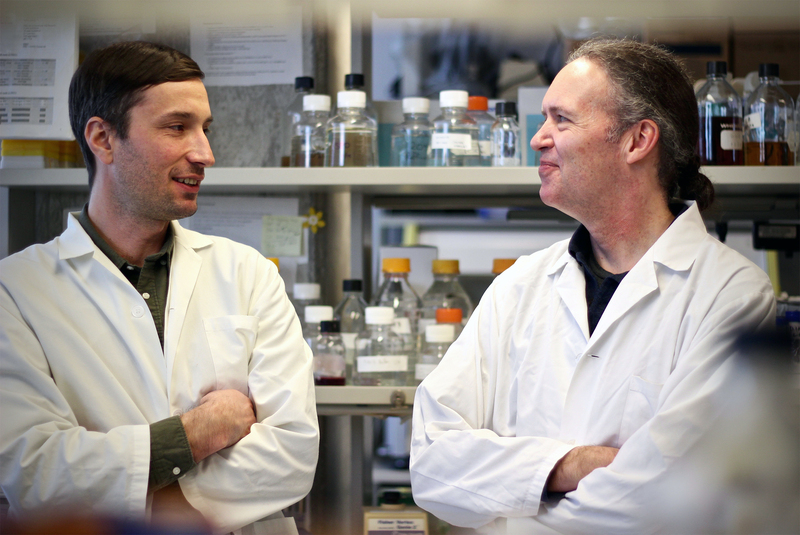 David Gallo, on the left, pictured with his PhD advisor, Professor Grant Brown, on the right, in his Donnelly Centre lab. Now a new study led by Grant Brown, professor of biochemistry in the Donnelly Centre for Cellular and Biomolecular Research, suggests that at times of stress, DNA replication errors are far more frequent than previously appreciated. Although the researchers studied yeast cells, a similar process could ratchet up mutation rate in our own cells leading to cancer and other disease. The findings have been published in a study in the journal Molecular Cell. 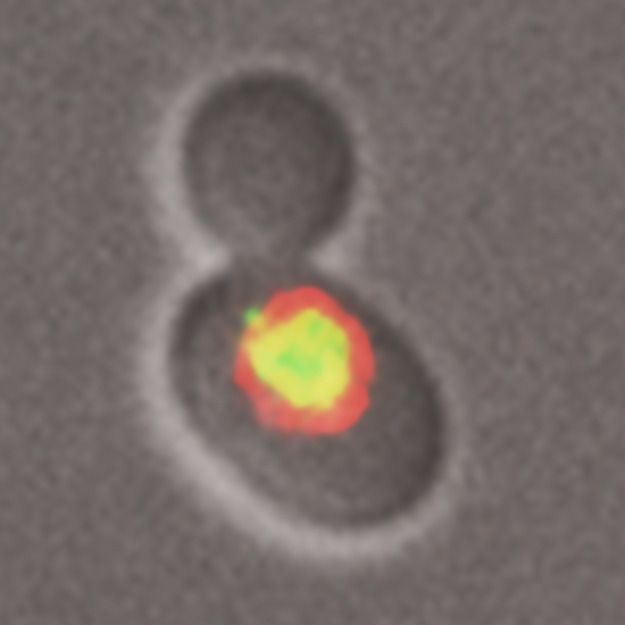 A dividing yeast cell making a copy of its DNA (in yellow). The red marks the nuclear envelope surrounding the genome. (David Gallo) To make a copy of their genome, cells first unwind the double DNA helix into single strands, where each strand serves as a template against which new DNA is synthesized through complementary base pairing, A with T and C with G. This is usually done by DNA polymerase enzymes which are “super accurate and only make errors very rarely to ensure the blueprint of life is passed to the next generation with high fidelity,” says Brown. The study was supported by research grants from the Canadian Cancer Society, the Natural Science and Engineering Research Council of Canada and the Italian Association for Cancer Research. Follow us on Twitter to keep up with Donnelly Centre news.